The gateway to the Costa del Sol, most travellers come to Málaga expecting package holiday resorts and high rise hotels. But this thriving port is a refreshingly un-touristy corner of Andalusia, with an Old Town characterised by crooked streets and grand old buildings, architecture ranging from a gaudy unfinished cathedral to a Moorish fortress, and sights such as the Picasso Museum and traditional food market. 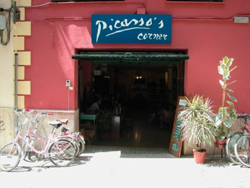 This hostel is right around the corner from Picasso’s house and within stumbling distance of the Plaza de le Merced, the city’s nightlife hub. 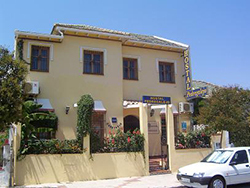 But the hostel itself has a lively social calendar, with themed nights ranging from Paella to Cocktails, and a bar serving cheap drinks. For quieter evenings in, cook up a storm on the terrace where there’s a Barbeque, play a round of ping pong or relax in front of the widescreen plasma TV. The Hostal Pedregalejo is perfect for beach bums- you are only a short walk away from the warm sandy beaches on the Costa del Sol. The air-conditioned rooms each have a TV and private bathroom, and there’s a Jacuzzi on site for kicking back after a day at the beach. There are a whole host of cheap restaurants nearby serving up the catch of the day, or you can stay at home and prepare your own meals, or dine in the hostel cafeteria, before spending a lazy evening in the bar. 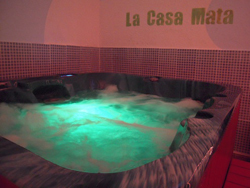 This is a young and funky hostel with bright and artsy interiors and a cool bar and video room with a comfy couch. Best of all, there’s a whole host of great freebies, from bathrobes and linen to a free city tour, and even a free hydro-massage spa room with Jacuzzi, perfect for unwinding after a hard day’s sightseeing, or hard night’s partying. ‘Domus’ means home and this hostel more than lives up to its name. The pretty bright blue building is a traditional Spanish house with two terraces for soaking up the sun, a lounge and ‘social room’ complete with pool table. In the cosmopolitan eastern part of the city, you’re close to the beach and some of Málaga’s coolest cafes and bars, and all the airy rooms are fully equipped with Wi-Fi, TV and air conditioning. For a grander place to stay, why not opt for this traditional Andalucian guest house, in the heart of Málaga’s historic Old Town. The atmospheric rooms are simple but beautifully furnished, with rustic Moroccan décor, and there’s a charming patio area surrounded by green gardens. 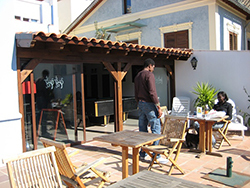 The staff offer a friendly and personalised service and are willing to help with any aspect of your stay, as well as cultural evenings in the hostel celebrating Flamenco, Tapas and traditional music.